Just returned home from speaking at another large international conference where meaningless clichés filled the air and rolled off of people’s tongues. Aside from being boring, clichés oversimplify complex issues and distract us from making forward progress. Clichés are a tranquilizer that retard our thinking and decision-making. Clichés amplify the superficial and form of a vapor barrier around powerful ideas. Sometimes, the clichés are not even true. Yet, they still manage to become a community standard. One particularly pernicious cliché goes something like this. The motivation behind uttering such banalities is likely positive. It acknowledges that children are competent and encourages adults to learn with them. However, these clichés suggest a power relationship in which all adults (particularly teachers) are resigned to the role of bumbling TV dad while the kids rule the roost. In education, this often serves as a justification for why teachers irrationally fear computers and modernity or appear to have stopped learning. The cliché diminishes the value of expertise and effort for adults and young people alike. Let me state clearly that I have no problem learning from anyone or any experience. I love learning with and from children. Nothing delights me more than when we co-construct some meaning. I just don’t go into classrooms thinking I am dumber than my students. I have experience, expertise, knowledge, wisdom, insights and a better Rolodex than they do. My old friend Branford Marsalis is widely considered one of the world’s greatest musicians. He is also a very fine educator. In the documentary, Before the Music Dies, National Endowment for the Arts Jazz Master Branford Marsalis was asked to share what he has learned from his students. This one-minute clip may surprise you. My colleague showed me a web site for a local artisanal bakery in Los Angeles. He pointed out how this piece of what you might view as a mission statement for the Proof Bakery might be applied to schools. I suppose it might be interesting to turn this upside down and ask what sort of bakery your school’s mission would produce? 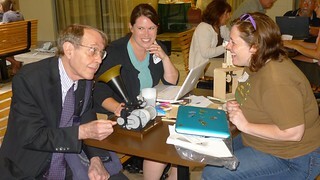 Last week, Ben Grey asked me, “In 5 tweets or less, can you share your vision for computing in education?” via Twitter. I’m not sure if anyone else was asked or the motivation behind the question, but I quickly rattled off the following five tweets. I could have accomplished the goal in fewer tweets, but a good tweet is a terrible thing to waste. The computer is a protean material with which you can make all sorts of shareable artifacts, theories and powerful ideas. The computer allows abstract ideas to be concretized through programming. simulation and modeling. The computer makes Papert’s “Mathland” possible where students can be mathematicians rather than being taught math. There is still time to register for Constructing Modern Knowledge, the project-based learning event of the year! Every school, teacher, administrator, graduate student or kid I teach gains from the expertise I developed working with every other school, teacher, administrator or kid over the past thirty years. My experiences and the insights gained from those experiences are my most valuable commodity, one I am happy to share. Much of my work as an educator is spent helping fellow citizens and educators recognize that even in these dark days, things need not be as they seem. This is accomplished through the sharing of anecdotes, examples of work, case studies, photographs and video of children learning in productive contexts for learning that may seem alien or impossible when compared with a school setting. This willing suspension of disbelief is dependent on compelling the case I can make. People may only choose from alternatives they have experienced or seen. A large part of my work is spent collecting the evidence necessary to change minds or creating compelling models of what is possible in a teacher’s own classroom. If one can change minds, it may be possible to change professional practice. Teachers at the school were able to watch day-in-the-life videos of the extraordinary inquiry-based learner centered environments of Reggio Emilia’s municipal preschools, ask questions and discuss how what they observed might inform or transform their practice in a K-8 setting half a world away. The generosity of the educators, students and parents of Reggio Emilia make such conversations possible, since their videos share models of teaching and learning that may be foreign to us or invisible otherwise. I have enjoyed some incredibly exciting experiences as an educator this year that remind me of why I teach and of the power computers can play in the construction of knowledge. This feeling of success is confronted by the sense that members of the edtech/ICT community have no idea what I do. I have low expectations for policy-makers and the media, but the edtech/ICT community should know better, right? They should join me in advocating powerful ideas and classroom revolution. Instead, too many seem more concerned with shopping, composing clever platitudes and congratulating each other via social media. It seems that the longer computers are in schools the fewer ideas there are for using them. When my colleagues whine and complain that change isn’t possible, I know in my soul they are wrong.They too could be classroom badasses, if only I could explain what I do and they believed what kids do with me. This inability to have a wider impact makes me feel like such a failure. Colleagues and friends like to learn about the work I do in classrooms around the world. Sometimes, I even blog about my experiences. Occasionally, I share materials I created for classroom use. Such sharing requires extra work and rarely captures the enthusiasm, joy, social interactions, interventions, epiphanies, powerful ideas or tacit gestures so critical to powerful learning experiences. Perhaps it is so difficult for others to imagine young children programming computers, learning without coercion or being _____ (mathematicians, scientists, engineers, authors, filmmakers, artists, composers…) because they have never seen it with their own eyes. If a picture is indeed worth 1,000 words, video may be worth a bazillion. Oh, how I wish you could have seen the 3rd grade class I taught late last week. The kids were programming in Turtle Art, a vision of Logo focused on creating beautiful images resulting from formal mathematical processes. I drew three challenges on the board and then groups of kids, who had used the software a few times before, set off to work collaboratively in figuring out mathematical ways to “teach the turtle” to reproduce the images I shared. I could tell you how the kids demonstrated an understanding of linear measurement, angle, integers, iteration, randomness, optical illusions, naming, procedurality and debugging strategies. However, if video had captured the session, you might have seen the kid who spends half the day getting a drink of water demonstrating impressive mathematical reasoning. You might have seen kids shrieking with joy during a “math” lesson, others high-fiving one another as they conquered each challenge and kids setting more complex challenges for themselves based on their success. You may have also noticed how the classroom teacher joined his students in problem solving – perhaps for the first time, but discovering the role the computer can play in education. Video might have captured how I choreographed the activity with less than a minute of instruction followed by 45 minutes of learner construction. Alas, there is no such video to share. I wish you could have seen what happened when I challenged a class of 5th graders to write a computer program in MicroWorlds that would allow the user to enter a fraction and have the computer draw that fraction as slices of a circle. The problem was so challenging that I offered to buy lunch for the first kid or group of kids to write a successful program. The kids worked for days on the one problem. If I had video, you would have seen students confront variables for the first time by using them. They also employed algebraic reasoning, turtle geometry, angle, radius and speaking mathematically to their collaborators. I wish I could share how I asked the right question at the precise moment required to help a kid understand the problem at hand, how I refused to answer some questions or give too much information and deprive kids of constructing knowledge. I wish you could have seen how excited the three little girls were when their program performed reliably. I wish you could have seen the non-winners who continued working on their programs regardless of the contest being over. I wish you could have seen the girls showing their program to their teacher and improving it based on aesthetic suggestions. I sure wish I could share a photograph of the 11 year-old female mathematicians arm-in-arm with #1 written on each of their arms held high. I wish you could have seen the workshop I whipped together with little notice for seventy high school teachers in an economically challenged region. I wish you could have shared their joy and laughter while engaged in recreating old-time radio broadcasts from the 1930s and 40s. Along the way, they learned to record, edit and enhance digital audio without a bit of instruction. They fanned out in teams across their campus in order to find quiet places to record and discovered a powerful literacy activity they could use with students the next day. They also learned that tech skills could be learned casually in the context of a rich project. Many schools have an uneasy relationship with photography, video and student identity. Some schools allow photography without the use of student names or the school identified. Others use initials or pseudonyms to indicate student identities. Some schools have prohibitions on publication of photos online. Some schools have no prohibitions whatsoever. Occasionally, I encounter schools that do not allow photography of any sort. None of this is new to me. The tension over photography often mirrors fears of the Internet My doctoral research was with incarcerated teenagers and required me to take photographs without student faces being visible. I got pretty good at that, but such carefully designed “shots” makes it impossible to show the life of the classroom. If schools, parents and teachers would embrace photography and video, school would be better for children. I truly believe that. Here are but a few arguments for classroom photography. Photography and videography may be used to capture learning stories that make thinking visible to teachers, invite other learners to contribute to another student’s thinking, inspire peers to build upon the knowledge or accomplishments of classmates and preserves the intellectual life of the school. Photography and videography provide an authentic way to demonstrate what students know and do for parents. The publication or even casual sharing of student project-work via media honors their accomplishments without badges, grades or other coercive gimmicks. Citizens are most likely to support schools that provide evidence of innovation. Photos and video displays of students actively learning sets a tone for a school and reminds inhabitants of what matters. Parents should be educated that putting a student’s photo or poem on the Web will not result in alien abduction. They should also be reminded that advocating for a newspaper photo of their kid kicking a goal is of less value than sharing classroom practice as a means to inspire and improve education in their school and beyond. In addition to their educational function as documentation that makes thinking visible for teachers planning learner-centered interventions, photos may be used for public relations and school publications. Imagine a place where a diverse population learns more in a few days than they otherwise would in years. Imagine a space where tinkering is encouraged and personally meaningful project development is supported by an expert faculty. Imagine a learning environment filled with books, art supplies, robotics materials, electronics, computers, cameras, musical instruments and creativity software. Imagine learners having the luxury of time required to realize their objectives and opportunities to work with some of the world’s most creative thinkers. Imagine learners making films, programming computers, building simulations, constructing robots, sewing wearable computers, creating animations and designing video games. Imagine a once-in-a-lifetime field trip to a see the future. Now, imagine that these learners are professional teachers. This is not a fantasy. It’s called Constructing Modern Knowledge, a summer institute for educators celebrating its fifth anniversary this July 9-12 in Manchester, New Hampshire. Educators from China, Costa Rica and Australia join Americans from across the USA at next month’s event. Constructing Modern Knowledge is built upon the simple proposition that you cannot adequately teach in the 21st Century, if you have not learned in this Century with the modern materials and technology that amplify human potential. How is a teacher or school administrator supposed to resource a classroom or teach in a way that takes advantage of the rich opportunities beyond the classroom walls without awareness and personal knowledge of what it feels like to learn with the tools of their age? Constructing Modern Knowledge participants are encouraged to take off their teacher hat and become reacquainted with their learner hat. Even the most creative educators need a spa day for their mind where their passion, curiosity and ambition can be reignited. Constructing Modern Knowledge not only creates a fantastic laboratory for tinkering, inventing and creating, but it offers opportunities for educators to learn with their heroes. Constructing Modern Knowledge is a chance for educators to reinvent themselves. In addition to an amazing faculty of gifted educators and pioneers, Constructing Modern Knowledge features remarkable guest speakers who spend time learning with and mentoring participants. Casey Neistat – award-winning DIY filmmaker with millions of Web views and star of his own HBO series, The Neistat Brothers. Mark Frauenfelder – Editor-in-Chief of Make Magazine, Founder of BoingBoing.net and author of Made By Hand: Searching for Meaning in a Throwaway World. Frauenfelder is at the forefront of the maker movement sweeping the globe. Our “field trip” to Boston will begin with a reception at the world-famous MIT Media Lab, where much of the future is being invented. On top of all that, Dr. Marvin Minsky, one of the world’s greatest living scientists, inventors and provocateurs will lead his fifth annual “fireside chat.” This year, Dr. Minsky will also be a participant in Constructing Modern Knowledge! Participants will have the opportunity to work on projects with or alongside of Marvin Minsky and our other distinguished guests! Previous CMK speakers have included Jonathan Kozol, Alfie Kohn, Deborah Meier, Derrick Pitts, Lella Gandini, James Loewen and Mitchel Resnick. Constructing Modern Knowledge is by its very nature an intimate professional learning event, but registration is still possible. Parents and citizens can certainly send their favorite teacher to “camp” this summer too. They’ll come back to school with a new bag of tricks and inspired to help students invent their futures. Check out the learning stories from last year’s institute, teacher resources and videos at This is What Learning Looks Like! See you at ISTE 2012! ISTE 2012 marks my 25th ISTE/NECC Conference as a presenter. The Creative Educator has published my fifth article in a series on effective project-based learning, A Good Prompt is Worth 1,000 Words. The text of this article is below. PDFs of the entire series may be downloaded and shared. I hope you and your colleagues enjoy it! A Good Prompt is Worth 1,000 Words. Over the past thirty years I have written curricula and taught curriculum writing. During the course of my career, I have seen curriculum used as a weapon and as a security blanket. Curriculum is often arbitrary, created far away from the students subjected to it. Seymour Papert used to ask why, if we understand that at best the curriculum covers a billionth of a percent of the knowledge in the universe, do we spend so much time quibbling over which billionth of a percent is so important? I know that much is expected of today’s teachers and students. I also know that the richest learning experiences and greatest demonstrations of student mastery have emerged from situations where maximum flexibility is exercised. If deep learning is the goal, then when it comes to curriculum, less is more! For years, I have watched kids in my classes do remarkable work without being taught to do so. I marveled at how participants in the Constructing Modern Knowledge institute could write a crazy project idea on the wall and then accomplish it within a matter of hours or days. I watched as graduate students told 10th grade English students to use their computers to compose a piece of instrumental music telling the story of Lady Macbeth; and regardless of the student’s range of expertise, they nailed it. During my doctoral research I formed a pedagogical hypothesis which I believe answers the question of how a learner is able to accomplish more, often in a short period of time, than they could have ever achieved following a traditional curricular scope and sequence. I call this hypothesis A Good Prompt is Worth 1,000 Words! With the following four variables in place, a learner can exceed expectations. The genius of this approach is that it is self-evident. If you lack one of the four elements, it is obvious what needs to be done. The same is true for prompt setting. The best prompts emerge from a learner’s curiosity, experience, discovery, wonder, challenge, or dilemma. However, all too often teachers design prompts for student inquiry or projects. If you absolutely must design a prompt for students, here are three tips you should follow. 1. Brevity. The best prompts fit on a Post-It! Note. They are clear, concise, and self-evident. 2. Ambiguity. The learner should be free to satisfy the prompt in their own voice, perhaps even employing strategies you never imagined. 3. Immunity to assessment. The best projects push up against the persistence of reality. What is a B+ poem or musical composition? How does an engineering project earn an 87? Most mindful work succeeds or fails. Students will want to do the best job possible when they care about their work and know that you put them ahead of a grade. If students are collaborating and regularly engaged in peer review or editing, then the judgment of an adult is really unnecessary. Worst of all, it is coercive and often punitive. Good prompts do not burden a learner, but set them free. Add thematic units, interdisciplinary projects, and a classroom well equipped with whimsy, objects-to-think-with, and comfort, and you set the stage for authentic student achievement. Attend Constructing Modern Knowledge, the world’s premiere project-based learning event! Kim Cofino recently convinced the Head of her international school to blog. Kim reached out to lots of folks and asked them to comment on his first post where he asked for advice. Since I was asked, I shared some of my views on school leadership for the future and on educational technology. After my comments (below), I add some thoughts I should have included regarding the limitations of blogging. As always, your comments are welcome. Welcome to blogging! Now you are a blogger! That was no big deal, right? Blogging IS no big deal. It is just writing, but on the Web. Sometimes there is even an audience for what you write. I suspect that you will never receive as many comments as for this post and you may not even get as far as mine. Regardless, I took my assignment from your colleague Ms. Cofino seriously. Blogging (and its social media cousins) are useful if you have a confessional nature and feel like sharing your thoughts with the world or if you need to have a question answered. It may also serve a utilitarian function in easily communicating with your school community. Blogging, like nearly every other school use of the Web, is essentially a literacy activity. One challenge for school leaders is finding ways to use computers to enhance the rest of what it means to be educated. For example, Is “math” taught in a Pre-Gutenberg fashion at your school or has computation and the social sciences’ need for number transformed kids’ experience as it has radically reinvented real mathematics? Regrettably, much of what is done in schools in the name of edtech or ICT is really just a form of “computer appreciation” The true power of the computer lies in its power as a computational instrument for constructing knowledge, the concretizing of formal ideas and the creation of artifacts in intellectual domains that would otherwise be inaccessible to children. This ability to use the computer to amplify human potential is only possible with awareness and teachers’ ongoing development of expertise. Leadership is critical for setting high expectations, asking “so what?” questions, supporting continuous growth of teachers and creating an atmosphere where the technology functions in the ways children expect – free of counter-productive, expensive and hysterical IT practices. Leaders in the digital age need to redefine “new” and “progress.” New isn’t about what you buy as much as what your students DO. Progress isn’t measured by bandwidth, but when classrooms are less mind-numbing, soul-killing and time-wasting. Leaders need to recognize that young people have a remarkable capacity for intensity and find ways to make school more intense, without making it more chaotic. So, blogging at least familiarizes yourself with an activity required of students. That’s the first step towards making sound educational decisions. Too many school leaders mandate that children do things that they themselves would never do or may never have even attempted. That isn’t leadership. Leaders also recognize that we stand on the shoulders of giants and that computing offers yet another attempt to realize the ideas of Dewey, Papert, Malaguzzi and other progressive educators. The greatest challenge facing school leaders is to abandon the notions that 1) education is based on scarcity and 2) learning is the direct causal result of having been taught. In the 21st Century, there is no reason for school to be concerned with creating winners and losers. Sorting, ranking, grading, labeling and classifying of students are destructive artifacts of a bygone era when access to education was scarce and limited to a privileged few. This is no longer the case. I won’t go into proving the plethora of examples to support this argument. I suspect you can find them yourself. School in itself is a technology with benefits and consequences – affordances and constraints that dictate the experience of its inhabitants. In the future, your school will NOT have the monopoly on children’s time you currently hold. The challenge is to answer the question of why your students and teachers are co-located in the same space for X hours per day? Leadership requires serious reconsideration of heuristics like homework, testing, grading and age segregation. These discussions need to be public and your constituents need to know where you stand or how you are thinking. Reflective school leaders know that this homogeneity of approach is ridiculous, unrealistic and ignores the diverse needs, interests and talents of children. Ultimately, it is also bad for the business of international schools. In many places, you are in the catbird’s seat. If a parent needs a school for their English-speaking child, you may be the only game in town. Yet, far too many international school leaders lack the courage necessary to articulate a unique educational stance and say, “we do things differently for the following reasons…” If you have a waiting list, you do not have to pander. Being a franchise of Oxford/Harvard Prep is no way to do good or to do well. That model makes your school more easily replaced by YouTube videos and online testing. At the very least, school leaders should recognize that people learn differently and invest in some “school within a school” programs where alternative models may be offered to children and parents. Boeing spends billions annually on planes that never fly while schools spend almost nothing on R&D despite the constant rhetoric about innovation. My experience is that whenever parents are offered a chance at a different educational experience for their child, they will seize it. Alternative programs within your school serve as incubators of innovation and may drive future practice in ways you can’t possibly anticipate. In summary, What if the policy of your school was to make every day the best seven hours of a child’s life? I wish I had pointed out that it may be difficult for a new blogger to assess the expertise, point of view or bias of a commenter he/she doesn’t know. I should have warned the new blogger about the torrent of clichés and meaningless platitudes that fill blog comments just as they bog down most contemporary discussions of education. I should have warned of the “attaboy” responses awarded for simply blogging. I should have mentioned that most commenters have little or no interest in the thoughts of the other respondents. Most of all, there should have been a discussion of whether or how much the blogger should respond to reader comments. Education is in desperate need of real dialogue. Social media may be an imperfect vessel for mindful discussion. In a few hours I will be making the hellish trip across the Pacific from Australia to Los Angeles for the second time in as many months. While here, I keynoted a conference, led PD at a school, did some consulting, met with new clients, caught up with old friends and was once again a Visiting Scholar at Trinity College (The University of Melbourne). I love Australia and have been here approximately 50 times over the past twenty-two years. It’s my second home. Perhaps the most rewarding part of this trip was during its final three days. I had the opportunity to spend hours in conversation with great educators who inspire me. I met veteran educator Leonie White six years ago, not long after she became principal of Thomastown Secondary College, when I was in-residence at her exurban school. Despite the challenges of running a high school in an economically challenged community with a large immigrant population, Leonie’s school feels calm, productive and headed in the right direction. She is a thoughtful school leader with the right priorities who knows every single kid in her school intimately. Leonie fights the good fight for kids and her teachers while proving that it indeed possible for principals to be part of their school community and not locked in their office buried under a pile of paperwork (real or imagined). I am so fortunate to have been able to get to know and often work with my heroes over the past thirty years. Steve, Anne and Leonie are at the “chalkface” every day and prove that a rich, mindful, joyous and creative education is possible for all children. I am lucky to have such inspirational friends. American public school educators have been insulted, mocked, punished, shamed, blamed and threatened by politicians, Bill Gates, corporations and the media for a decade. Their professionalism has been reduced by name-calling, scripted curricula, “common core” standards and the publication of standardized test scores. Their schools have become the playthings of billionaire bullies and hedge fund managers with public school treasure being surrendered to shady privatizers and charter school conglomerates. American public school teachers have watched more of their students come to school hungry and without proper medical care. 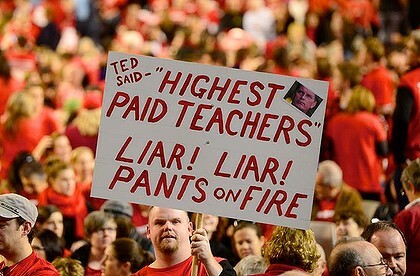 They’ve watched public education be dismantled by unqualified clowns in NY, Louisiana, Chicago, Michigan and Wisconsin. American teachers have seen their benefits cut, right to organize eliminated, working conditions deteriorate, supplies dwindle and pensions disappear. And what have American educators done about this? Nothing, aside from a handful of really clever blog posts. I am writing this really clever blog post from Melbourne in the great state of Victoria, Australia. The new conservative state government here in Victoria wants to introduce a pay-for-performance (merit pay) scheme for public school educators and has offered a raise. Such a contract offer would be like Xmas in Philadelphia! How has that offer been received by Victorian public school educators? THEY SHUT DOWN THE ENTIRE F-ING SYSTEM TODAY! That’s right. 25,000 teachers stayed home, 10,000 marched on Parliament and they closed 150 public schools. Parents were politely alerted in advance to make other plans for the day. Many principals supported the strike and even marched with their colleagues. Teachers here in Australia are not human piñata or professional victims. They stand up for themselves, their students and their communities. Teachers here have medical insurance, secure pensions and enjoy long-service leave. Please take a look at this news clip where teachers swarm the city and speak of how they feel insulted by the government. They have promised more strikes in the future. Striking teachers fill arena - This is what democracy looks like! TEACHER: It’s very divisive to talk about performance pay cuts, particularly when you’re dealing with children. They are not products; we’re not part of a corporate empire and I’m here to support my colleagues and really to get justice for the students. TEACHER 2: There’s no research basis to performance pay and really what we’re trying to do in schools is work as teams to improve student outcomes. It’s not going to work with performance pay.